Posted on May 15, 2018 by Kelly M.
Looking for a New England adventure this summer? Drumlin Farm Camp has added new trips to our Adventurer Camps! The Adventurer Programs are a great introduction to outdoor trip and travel programs, for middle schoolers entering 7th and 8th grade. They’ll enjoy scenic hikes, days on the beach, swimming holes, quiet paddles, and plenty of fun around the campsite. Campers make great new friends while discovering a new part of New England, making summer 2018 one to remember! 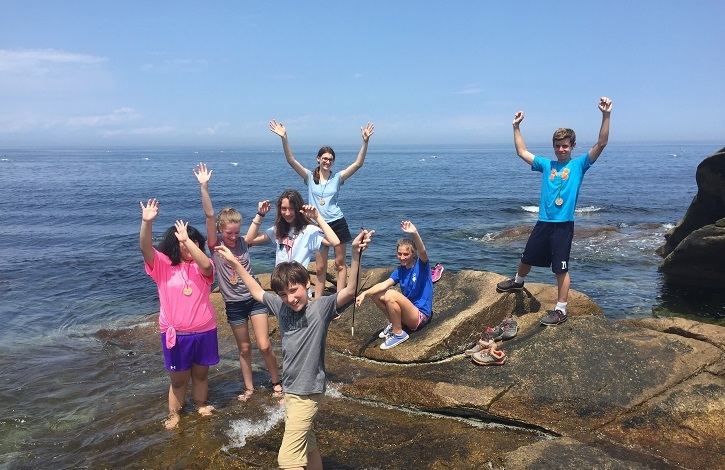 One to two weeks of nonstop adventure: spend the first week of camp getting to know each other on day trips to places like Purgatory Chasm, Halibut Point, and Mount Wachusett, then take off on a 5-day overnight adventure the second week! One week trips are also available where we’ll just focus on the 5-day overnight. Adventurers hiking the white mountains. 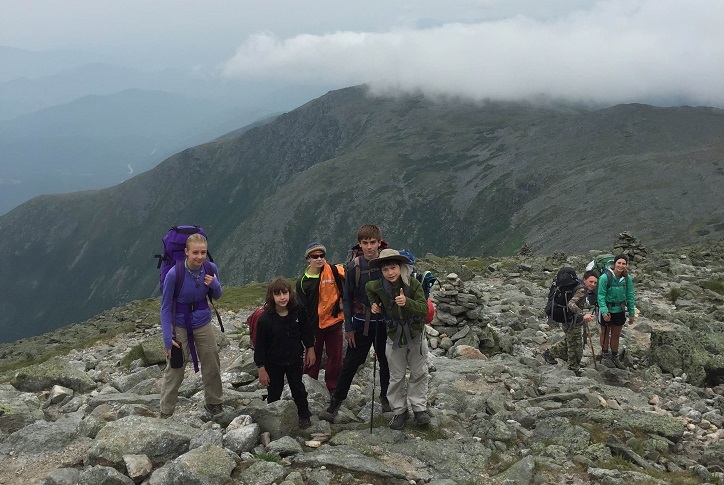 Backpack the White Mountains: Hike from hut to hut along the slopes of Mount Washington! This year, the Adventurers will head to the Lake of the Clouds and Mizpah huts and set their sights on the highest point in New England. Enjoy luxurious back-country camping as you sleep and eat in AMC Huts. Hike Southern Vermont: We’re heading back to Vermont! Explore the southern part of Green Mountain National Forest. We’ll hike mountains, search for waterfalls, and relax at the end of the day with a dip in the pond at our home-away-from-home, Woodford State Park. Farming the Connecticut River Valley: Believe it or not, there’s more to farming than Drumlin Farm! This very special new trip heads to the border of New Hampshire and Vermont, where we’ll get a closer look at different kinds of New England farming. Visit Vermont Farmstead Cheese Company in Woodstock, Vermont and learn about the process of cheese making from cow to wheel. Take a short hike up Mount Cardigan for panorama views of New Hampshire and Vermont, and head north to the Farm at Wood’s Hill to discover the secrets behind one of our local farm-to-table restaurants! Exploring Coastal Rhode Island: This brand new trip takes us down the western half of Narraganset Bay and right to picturesque Port Judith. We’ll spend some time on the beach, get muddy digging for clams at low tide, learn about the Rhode Island Audubon Society, and more! Every day will be a different adventure. Hike the Berkshires: Due to popular demand, we’ve added a second trip to the Berkshires! This trip focuses on hiking some of the region’s most famous peaks. Summit Pine Cobble Mountain and Mount Lenox before setting your sights on the highest peak in Massachusetts: Mount Greylock. Relax each afternoon in the river at the campground and get ready for the next day’s adventure. With so much opportunity, the last thing you’ll want to do this summer is stay indoors! Join Drumlin Farm Camps for outdoor, educational, fun activities throughout the state and New England. Make 2018 a summer to remember! This entry was posted in Camp on May 15, 2018 by Kelly M..